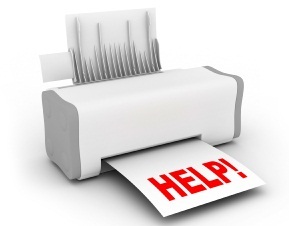 There are a number of things that could go wrong with a printer during operation. Some of these issues are fixable by the user and some require a professional. Below are the Top 6 most common printing problems, as well as simple troubleshooting tasks that you can attempt before seeking help. Slow Speed There are a few solutions to this problem, but the two primary answers lie in the memory and print mode settings. If your print demands are larger than your printer’s memory capacity, this will increase the amount of time it takes for a task to get from the computer to the output tray of the printer. Fix this by upgrading the memory. For optimal speed, the print mode should be set to draft or eco mode. This will minimize how much ink or toner is applied, thus taking less time to complete the page. Poor Print Quality Inkjet printers: Poor quality most likely means the printhead is clogged or dirty. There is an internal cleaning utility available for most inkjet printers, but we offer a more in-depth look into how to clean your printhead.Laser printers: The imaging drum is the primary component in transferring an image or text. The laser will burn the information onto the imaging drum, which will then collect the toner and apply it to the paper. If there is a scratch or debris on this drum, the images will be flawed. Try to replace or clean the printer drum. Expensive Ink/Toner Often, printer manufacturers will sell the machines at cost or even lower to lure consumers in, and then make their money back by selling overpriced replacement ink and toner cartridges. The solution to this is simple – use compatible or remanufactured toner and ink cartridges. Many reputable third-party vendors are easily accessible online and provide compatible replacement cartridges that cost considerably less but often come with a guarantee to perform with the same quality as OEM cartridges. Paper Jams Easily the most frustrating issue of the 6 highlighted in this list, paper jams are typically easy to fix and often preventable. Be sure you are implementing the right kind of preventative paper care before it is loaded into the printer. Also, make sure the alignment is correct and the feed rollers are cleaned or replaced regularly. Jobs Sent to Wrong Printer Understand that the computer program you are using will select a default printer if one is not established by you. So, if you do not set your printer to default in an environment with multiple printers, do not be surprised if you are walking to each machine in the office trying to find your documents. Also, be aware that changing or upgrading the operating system can reset the printer selected as the default. Wireless Network Issues Wireless, because it is based on radio waves, loses strength with distance. So the desk furthest from the printer may have issues printing. You can use a wired ethernet connection, or try a wireless bridge to boost the signal. Well, there you have it. The issues listed above may not be the most difficult to fix, but they are among the most common problems. Use the solutions column to try rectifying the problem yourself. If you continue to have an issue, contact your manufacturer for further assistance.